The Basilica of the National Shrine of the Immaculate Conception in Washington, D.C., is the pre-eminent Marian shrine of the Roman Catholic Church in the United States. This beautiful votive church of pilgrimage, older than some of the states of the Union, honors the Blessed Mother under the title of the Immaculate Conception as the Patroness of the United States. Built as the medieval cathedrals of Europe, without structural steel beams, framework, or columns, the Shrine is entirely of stone, brick, tile and mortar. It is a blending of techniques, both ancient and new, in which architecture mingles with symbol. Envisioned by its founder, Bishop Thomas J. Shahan (1857-1932) as a “monument to artistic truth” that would speak with “divine eloquence,” the Shrine is home to the largest collection of contemporary ecclesiastical art in the United States. Amid a rich patina of mosaics, sculptures, and artistic renderings, the more than 65 chapels and oratories reflect not only the devotional traditions of the American Church but also the rich ethnic mélange of the Universal Church. In 1990, Pope John Paul II (1920-2005) named the National Shrine a minor basilica, the 36th in the United States. 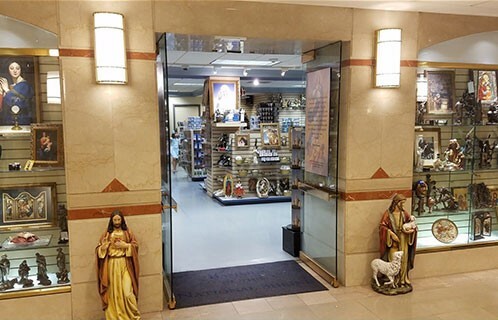 The Shops at the National Shrine are open 7 days a week to serve the spiritual needs of the many pilgrims who visit the Shrine daily. What you will find on this website is a small sampling of the many different items thats the Shops carry. If you need to contact us for any reason our phone number is 1-800-333-4411.